Employee management tools that are paper-driven and spreadsheet-oriented are no longer viable workforce development strategies. The modern worker wants performance evaluations to be goal-oriented and feedback-focused, with learning opportunities that are personalized to their own career aspirations. 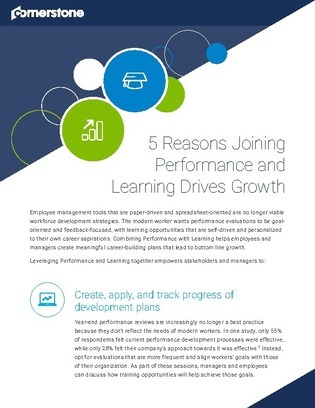 Access this white paper to discover the 5 reasons why joining performance and learning drives employee and company growth.